The economy has added 8.2 million jobs in the private sector since the Great Recession began in December 2007, but creation of construction and manufacturing jobs continues to lag. These industries are important to workers because they provide good jobs and high wages (that are even better if the workers are unionized). They are also some of the highest paying jobs for people without a bachelor’s degree. In July 2017, there were still 1.9 million fewer workers in construction and manufacturing than at the start of the Great Recession. Source: EPI analysis of BLS Current Employment Statistics and Employment Cost Trends public data series. Industries such as hospitality, health care, temporary help services, and other professional business services that have gained jobs since the beginning of the recession pay substantially less than construction and manufacturing industries. Hourly pay in job-gaining industries is $25.24 on average, versus $29.70 in construction and $30.52 in manufacturing. 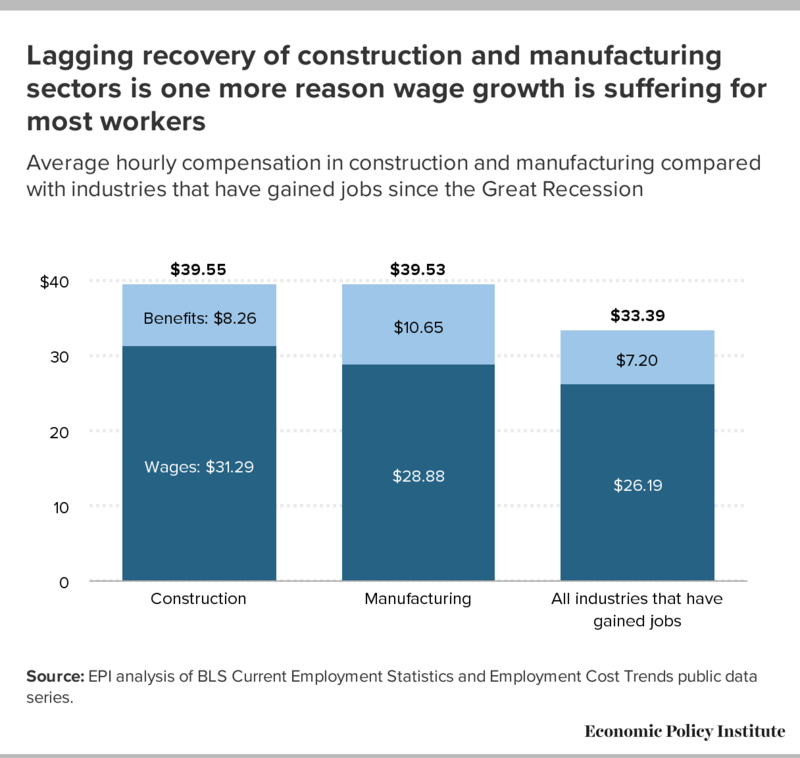 Total compensation (which includes both wages and all benefits) in job-gaining industries is $31.03, while compensation in construction and manufacturing is $38.73 and $39.66, respectively, 24.8 percent to 27.8 percent more than in job gaining industries. Boosting job growth in industries that traditionally provide strong wages for the majority of working people (the bottom 70 percent) would help a lot. However, infrastructure investment has been in long-run decline, and the U.S. trade deficit in non-petroleum goods has increased sharply since 2009. Investments in infrastructure and stemming rising trade deficits would do much to help the overall economy and restore jobs to two well-paying sectors that badly need them. Unfortunately, the Trump administration budget is a disaster for public investment, and the administration has refused to label China a currency manipulator. Persistent undervaluation of the Chinese yuan has contributed to growing trade deficits that cost 3.4 million U.S. jobs between 2001 and 2015. Stronger growth in manufacturing and construction could provide a much-needed boost to wages for working Americans.